What Are The Best Online Certificate in Technology Programs? What Else can I Expect From an Online Certificate in Technology Program? What Can I Do With a Technology Diploma? Information technology is an enormous and evolving field that impacts many industries. With tech-savvy professionals constantly developing new computer-based tools and applications, innovation continues to drive the information technology sector. The Bureau of Labor Statistics (BLS) projects an 11% increase in employment for computer support specialists between 2016 and 2026, and the employment of web developers is projected to grow 15% in that same period. These growth rates are much faster than the national average of 7%. If you are interested in pursuing a computing-based career, earning an online information technology certificate imparts the skills and knowledge necessary for success in this promising field. Founded in 1854 in Lawrence, The University of Kansas offers programs rooted in research and teaching, including a variety of online information technology certificates. The school’s Continuing and Professional Education Department offers certificates in engineering technology focused on process instrumentation and control, cybersecurity for industrial automation and control systems, batch process control management, reliability engineering, and maintenance management. Students can complete all certificates 100% online, through live seminars delivered by the same faculty members who teach on campus. Distance students can start one of KU’s engineering technology certificates at any time, through self-paced study, and may complete as many or as few credits as they would like each term. Distance learners can pursue an online information technology certificate through BSC in Bismarck, North Dakota. The program certificate in electric power technology, available entirely online, suits both aspiring and experienced electric utility workers. BSC created the certificate in collaboration with the Energy Providers Coalition for Education. Online classes start every 3-5 weeks, and distance learners can enroll in the program at any time. Students complete core courses in one of four specializations: metering, line construction, substation, or system design. The certificate prepares graduates for careers including substation electricians/technicians, utility designers, and meter readers. Applicants must submit a score of at least 16 on the math section of the ACT, a pre-algebra score of at least 34 on the COMPASS, and a score of at least 41 on the ACCUPLACER. Students may transfer credits from the certificate to BSC's online bachelor’s of applied science in energy management. Established in 1906 in Statesboro, GSU offers a postgraduate online information technology certificate through its College of Education. Students can complete the instructional technology certificate program entirely online, with no in-person requirements for graduation. Approved by the Georgia Professional Standards Commission, the certificate prepares graduates for certification as a P-12 instructional technologist within the state. GSU’s online instructional technology certificate program requires 36 credit hours in courses including instructional design, technology-based assessment, and digital learning environments. Applicants must possess a master’s degree in education from a regionally accredited college or university, a teaching certificate, and a minimum cumulative 2.5 GPA in all undergraduate and graduate work. Applicants must also submit to a criminal background check and disclose any prior misconduct. Millersville University of Pennsylvania offers an online information technology certificate, available 100% online with no required campus visits. The STEM education endorsement specialist certification suits working Pennsylvania teachers seeking to improve their teaching skills in science, technology, engineering, and math. Teachers in non-STEM disciplines may also pursue the certificate. While the endorsement does not lead to state licensure, it can be added to a Level I or Level II teaching certificate in the state of Pennsylvania. Distance students pursuing the STEM education endorsement build critical thinking, analysis, and problem solving skills. The interdisciplinary 12-credit program comprises four courses, including engineering principles and concepts for the non-engineer, and mathematics in the school program. Applicants can opt to take one or more courses on a trial basis before formal acceptance into the program. A private liberal arts institution in Nashville, Tennessee, Lipscomb offers programs affiliated with the Churches of Christ. Distance learners at Lipscomb can pursue a 100% online information technology certificate, with no campus visits required. The technology integration specialist certificate comprises 12 credit hours. Students can complete the program in one year. Graduates master the use of technology to help their students learn better, as well as to demonstrate to their students how technology can improve their lives. Benefits available to online learners include a scholarship for full-time educators, worth up to 26% of the cost of tuition. Qualifying students may also pursue other types of financial aid, including grants. Additionally, every distance learner at Lipscomb receives an iPad, and every course in the curriculum incorporates the iPad as a learning and teaching tool. The University of West Florida, in Pensacola, offers an online information technology certificate, available 100% online. UWF’s certificate in technology systems support prepares graduates for careers in network operations and telecommunications. Applicants must possess basic computer skills, including word processing applications, the internet, and presentation tools. Distance learners can complete the program in as little as two semesters, taking as many or as few credits each term as they prefer. UWF’s certificate in technology systems builds skills in system design, website development, creating implementation plans for telecommunication and network systems, and planning training and instructional activities. The certificate requires completion of 18 credit hours, in courses including web presence deployment strategies, technology systems operations: architecture and components, and technology systems implementation strategies. Located in Warren, Michigan, Macomb Community College offers an online information technology certificate comprising 20 credit hours, including four required courses and two electives. Macomb’s renewable energy technology certificate explores introduction to sustainability, renewable energy concepts, and energy management fundamentals. Although not required, Macomb recommends students earn a grade of “C” or better in three of the certificate’s core courses. Students may complete the certificate in just two semesters, or take up to one year. Candidates must maintain a minimum cumulative 2.0 GPA to earn the certificate in renewable energy technology. The certificate prepares individuals for employment in renewable energy fields. The holistic program emphasizes scientific principles, professional skills, and industrial processes. Students may choose to participate in laboratory experiences to gain practical skills in renewable energy occupations. Located in Boston, Massachusetts, Cambridge's online information technology certificate in science, technology, engineering and mathematics (STEM) suits educators in early childhood education, elementary schools, middle schools, and special education with a background in one or more STEM fields. The 12-credit certificate includes courses in mathematics, science, and engineering, as well as elementary and middle school teaching methodologies. Additionally, coursework explores teaching project-based science, Earth’s place in the universe, and diagnosis and remediation of learning problems in mathematics (K-12). Graduates qualify to work as skilled elementary and middle school math teachers and to take the Massachusetts grade five and eight MCAS exams. After completing the certificate, graduates also qualify to pursue a Massachusetts certification in mathematics, earned by passing the appropriate state MTEL exam. Although curriculum requirements vary from one program to the next, students pursuing an online information technology certificate complete coursework related to a few central topics. Below are courses that students commonly take while completing an online technology certificate program. Database design and implementation: In this course, students learn how to design, develop, and implement database systems. In addition to discussing the business aspects of database design and addressing potential security concerns, students gain practical modeling and diagramming experience. Courses related to database design and management are particularly relevant to aspiring database administrators and computer network architects. Introduction to information systems: This course gives students an overview of computer systems, information management, internet security, and software basics. Students examine digital safety, information security, and online privacy. They may also explore how information systems affect business communication and decision making. Systems design coursework is especially valuable for students who hope to become network and computer systems administrators or computer systems analysts. Programming concepts and problem solving: In this course, students learn to address computer programming issues. They develop user interfaces, examine program structures, and familiarize themselves with the syntax and logic of programming languages. Students test program functionality, modify existing programs, and develop their own. Computer programming courses can benefit students who hope to establish careers in software development, web development, database administration, computer programming, or computer and information systems management. How Long Does It Take to Get an Online Certificate in Technology? Online information technology certificate programs require students to complete 12 to 18 credits. Typically, coursework is entirely program-specific, meaning students don't spend time fulfilling general education requirements. Some programs require participants to join a cohort of students, completing coursework on a fixed schedule similar to that of a traditional, term-based program. Other formats are more flexible, allowing students to take courses at a pace best suited to their needs. However, schools typically expect students to complete these programs within a specific length of time. Online technology certificate program lengths vary by school, but full-time students may earn a certificate in five to 18 months. Some programs allow students to specialize in a particular area of information technology, while others provide a general overview of the field. For aspiring internet technology professionals, earning an online information technology certificate can be an important first step to a rewarding career. Certifications can help computer professionals develop technology expertise and stand out to hiring departments. However, a degree can give job candidates an even greater career advantage. After completing an online technology certificate program, students may choose to earn an associate, bachelor's, or master's in the field. Completing a degree typically requires more time and money than earning a certificate, but some schools grant course credit to degree-seeking certificate holders. Additionally, some institutions offer combined programs that allow students to simultaneously earn a degree and certificate. After earning an online information technology certificate, aspiring computer professionals can enter fields such as internet security, government, healthcare, and the service industries. They may seek positions as computer support specialists, web developers, computer systems analysts, or network and computer systems administrators. A 40-hour workweek is typical for professionals in these fields, though computer support specialists and network and computer systems administrators may work unusual nights or weekends to ensure 24/7 system functionality. Computer systems analysts, web developers, and network and computer systems administrators must have good communication skills, as their responsibilities often entail collaboration with other technology professionals. After earning an online information technology certificate, graduates may seek employment in one of the following positions. These specialists assist computer users and organizations. They evaluate system functionality, perform network maintenance, troubleshoot networks, and provide technical advice to organizations. They may work directly with computer users by remotely identifying customers' problems and walking them through solutions. They may also make site visits, provide software training, and offer system feedback to team members and management. These administrators oversee an organization's day-to-day computer network operations. They determine system needs, install new hardware and software, make necessary upgrades and repairs, and maintain network security. These professionals also optimize network performance and ensure that systems are fully operational. Other components of the job include managing data storage, workstation functionality, and telecommunication networks. These professionals design and create websites. Their responsibilities include website visuals, performance, storage capacity, and content. Developers write code, integrate media, and monitor online traffic. They may work with clients and graphic designers to determine a website's content and aesthetic. While some web developers direct all aspects of website creation, others specialize as back-end developers, front-end developers, or webmasters. Holding an associate, bachelor's, or master's degree can greatly improve information technology professionals' employment and career advancement potential. Students who earn a degree after completing an online technology certificate program may become computer programmers, computer network architects, database administrators, information security analysts, or software developers. In addition to qualifying for more positions, degree holders demonstrate to potential employers that they possess both technical expertise and the soft skills that the workplace requires. Employers may prefer to hire candidates who hold both a certification and a degree in the field. Graduates of online technology certificate programs may choose to continue their education by pursuing one of the degrees listed below. Associate of science in information technology: In addition to studying computer fundamentals through core coursework, students who complete an information technology associate degree take general education courses in subjects such as writing, math, and economics. They also take elective classes related to information technology, and they may use focus areas to center their studies on a particular aspect of the field. Bachelor of science in information technology: To earn this degree, students study the relationship between business and information technology. They fulfill general education requirements by taking courses on topics such as communications, natural science, and the humanities. Students then complete core coursework specific to information technology. They may select a concentration or area of specialization such as project management or business intelligence. Bachelor of science in information sciences and technology: This program also introduces students to the role of information technology in the business world, providing opportunities for project-based learning and collaborative programming. As students complete the required general, core, and elective coursework, they may choose to simultaneously earn an online information technology certificate as well. For students who choose to pursue an online information technology certificate, it is important to enroll in an accredited program. External accreditation confirms that a school or program meets certain quality standards. During the hiring process, employers typically want to know that a candidate's credentials are from an accredited institution. Additionally, students who complete an accredited online technology certificate program can more easily transfer credits and qualify for financial aid. Regional accreditation is generally regarded more highly than national accreditation, as national accreditation is a less rigorous process. 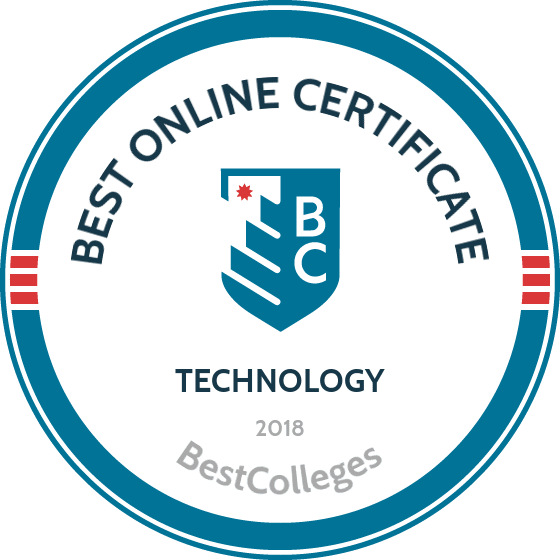 To verify an online technology certificate program's accreditation, prospective students may locate a database of nationally recognized accrediting agencies on the U.S. Department of Education or Council for Higher Education Accreditation websites. Factors that determine annual wages for information technology professionals include education level and location. Employer type also affects earning potential in this field. The table below features BLS data regarding the median annual salaries of network and systems administrators who work in the position's top five employing industries. Students pursuing an online information technology certificate may benefit from joining a professional organization within the industry. Professional associations for information technology advocate politically for member interests and provide access to industry data, research publications, product discounts, and career resources. Members may take advantage of professional development and networking opportunities by joining a local chapter, attending national conferences, and participating in continuing education seminars. Students and recent graduates of online technology certificate programs may seek membership in one of the organizations listed below. CompTIA AITP provides early-career information technology professionals with resources including the TechTalent career portal, online training, industry research, and product discounts. Members may get involved with a local chapter, attend networking events, and participate in virtual conferences. They may also earn additional industry credentials through the CompTIA Certmaster program. The ISSA offers networking, leadership, and continuing education opportunities to a global community of cybersecurity professionals. Members may volunteer for local chapters, attend international conferences, contribute to industry publications, and participate in special interest groups. IEEE provides technology professionals with access to digital publications, career resources, continuing education, and certification programs. Members may join research-focused technical societies or perform humanitarian outreach. New information technology workers may choose to join the IEEE Young Professionals community. Students who pursue an online information technology certificate may be eligible for financial aid in the form of grants, loans, work-study awards, and institutional financing plans. Some programs offer deferred payment plans, exam vouchers, and scholarships as well. Additionally, some schools grant course credit for professional experience. This lessens the financial burden of certification by allowing industry-seasoned students to complete the program more quickly. By completing the Free Application for Federal Student Aid (FAFSA), students can qualify for federal funding opportunities. Students may also find industry-specific scholarships, grants, and fellowships through professional organizations such as the ISSA or IEEE.